Gnocchi is a wonderful dish, but it can be time-intensive, making it a difficult trick to pull off midweek. 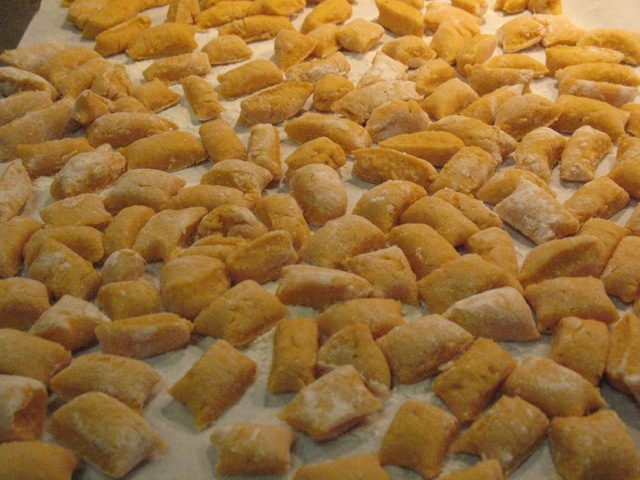 Sure, you can buy frozen or pre-made gnocchi, but they just aren't very good. I've bought some from Whole Foods a few times, but compared to what you can make at home, they are as dense as bricks. Gnocchi is pretty hearty no matter. After all, we're talking about a potato dumpling. But made just right, gnocchi is like little soft pillows. 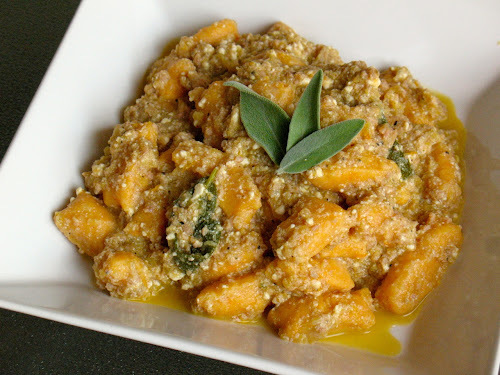 I've made regular gnocchi for this site before, so this time I wanted to try sweet potato gnocchi. The process is basically the same, except that I substituted about half the potato with sweet potato. I think the trick is not using too much flour. The gnocchi should be mostly potato. Not all recipes for gnocchi call for egg, but I find it helps give it good texture. For the sauce, I was inspired by our recent trip to Lupa Osteria Romana in Greenwich Village. Their ricotta gnocchi had this sauce with really great texture. Rather than having chunks of sausage and vegetable, it was quite smooth. You wouldn't necessarily know by looking at the sauce what ingredients were in it, but the flavors were definitely there. Because it's basically impossible to break up cooked sausage that small, I used the food processor to smooth out the sauce. Rather than roasting the potatoes, I used the microwave. This saved an amazing amount of time over having to heat the oven to roast the potatoes (which would take well over an hour) and avoided the possibility of unwanted moisture from steaming. In fact, it cut the total cooking time of this dish down to about 90 minutes. Granted, for many people that's still too much time in the kitchen for a weeknight, but it's a far cry from an all-afternoon project. 1. Microwave the sweet potato 5 minutes on high. Turn over and microwave another five minutes until cooked through. Microwave the russet potatoes 5 minutes on high, turn over and microwave another five minutes, until cooked through (you can cook them together, but it will probably take longer. Be sure to cook both types of potatoes until soft). Set aside to cool a bit. 2. In a large sauté pan, cook sausage over medium heat until cooked through, breaking up with a spoon as it cooks. Remove from pan. Add olive oil and sauté fennel and onion until well browned, about 15 minutes. 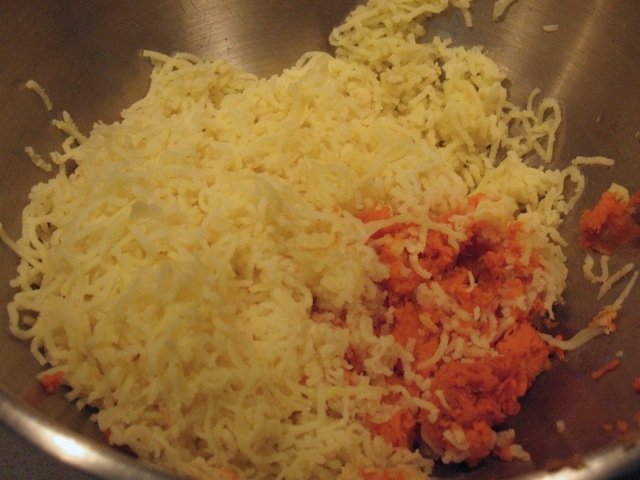 Add tomatoes and cook until they start to soften, a couple minutes. Add 1 cup of chicken broth, stirring to deglaze pan. Add back the cooked sausage and pour contents of pan into food processor. 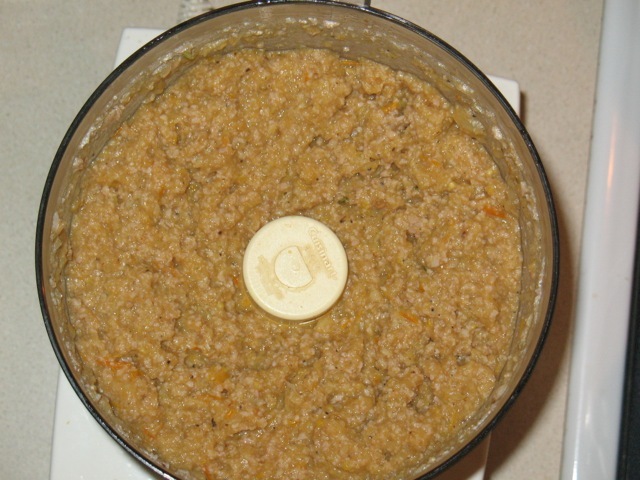 Pulse a few times until sauce is almost smooth (some chunks should remain). Return sauce to pan. Add additional cup of chicken broth, sage leaves and salt and pepper, and simmer on low while gnocchi cooks. 3. Cut the cooked potatoes in half and press through a potato ricer into a large bowl. Combine the egg with the nutmeg and 1 tsp. of salt. Make a well in the mashed potato and add the egg mixture. Stir with the potato to mix, then add the 1 1/2 cups of flour. Use your hands to knead the mixture together until the flour has combined with the potato. Divide the dough into six parts. 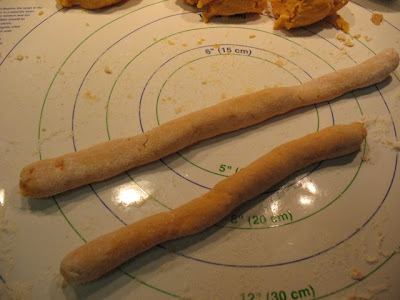 On a well-floured surface, roll each piece of dough into a long rope about 3/4-inch thick. Using a knife, cut the ropes into 1/2-inch pieces. Set the formed gnocchi on a floured baking sheet until ready to cook. Some people like to use a fork to make ridges on the gnocchi. The first time I ever made it, I did that. It took a lot of extra time, and I decided it was unnecessary. 4. Bring a large pot of water to boil. Cook gnocchi in batches, dropping about 1/3 of the formed gnocchi into the water at a time. Cook each batch for about 3 minutes. Remove with a slotted spoon. 5. Stir the fresh ricotta into the meat sauce. Add the cooked gnocchi. Serve topped with fresh sage and, if desired, parmigiano-reggiano. Your potato gnocchi was really good. I'm not sure if I liked it as much as regular gnocchi. Perhaps you should make both again so I can decide.